Mule Deer have large ears that move constantly and independently, from whence they get their name, "Mule" or "Burro Deer." They do not run as other deer, but have a peculiar and distinctive bounding leap (stotting) over distances up to 8 yards, with all 4 feet coming down together. In this fashion, they can reach a speed of 45 m.p.h. for short periods. This stocky deer with sturdy legs is 4 to 6-1/2 feet in length and 3 to 3-1/2 feet high at the shoulder. During the summer, the coat on its upper body is yellow- or reddish-brown, while in winter more gray. The throat patch, rump patch, inside ears and inside legs are white with lower portions running cream to tan. A dark V-shaped mark, extending from a point between the eyes upward and laterally is characteristic of all Mule Deer but is more conspicuous in males. Males are larger than females. The bucks' antlers, which start growth in spring and are shed around December each year, are high and branch forward, forking equally into 2 tines with a spread up to 4 feet. The Mule Deer is slower and less colorful than the White-tailed Deer, but its pastel, gray-buff color provides a physical adaptation to the desert environment which disguises it from predators like the Cougar, the Coyote and the eagle who will swoop down on a fawn. Mule Deer have no canine teeth and, like the cow, have a multi-part stomach, the first two chambers of which act as temporary storage bins. Food stored here can be digested later when the deer chews its cud. No. of Young: 1-4, 2 avg. There are 2 major subspecies: the Mule Deer, with tail white above, tipped with black; and the Black-tailed Deer, with tail black or brown above. The Cervidae Family includes deer and their allies, including moose, elk, and caribou. Member of this family occupy a wide range of habitats, from arctic tundras to tropical forests, and can be found over most of the world. All have slender legs. Most are brown or gray in color, with white spots characterizing the young, and in a few species, the adults. In all but one genus of cervids, at least the males have antlers. The Mule Deer, while closely related to the eastern species-the white-tailed deer, are remarkably distinct in their biological, ecological, and behavioral attributes. The Mule Deer carries its thin, black-tipped tail drooped, unlike the uplifted, bushy white tail of its cousin. They have a distinctly different gait from the leisurely, graceful leaps of the white-tail. 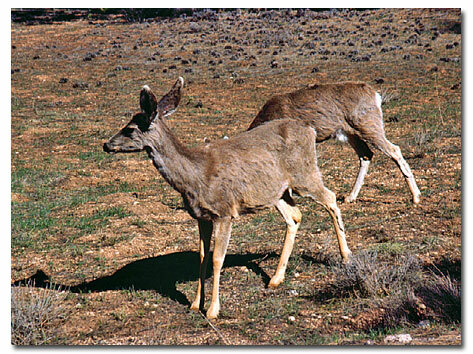 When startled, a Mule Deer will move in a series of stiff-legged jumps with all four feet hitting the ground together. 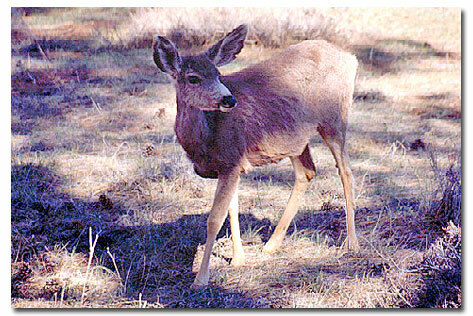 Mule Deer are usually a dark gray-brown, with a small white rump patch and a small, black-tipped tail. Their large ears are distinctive. White-tail deer are tan in color, with a larger tail. Mule Deer antlers are normally smaller and branch to form 2 equal forks, while the male White-tailed Deer has forward curving antlers with a number of points (tines) branching from the main beam. Deer are not especially vocal, although young fawns bleat on occasion. Injured deer utter a startlingly loud "blatt" or bawl. The tail is usually tipped in black with a white basal portion, and its under parts are white. The Mule Deer large ear is gray on the outside and white on the inside. Another physical adaptation, its larger feet, allows the Mule Deer to claw out water as much as two feet deep, which it detects with its keen sense of smell. When startled, a Mule Deer will move in a series of stiff-legged jumps with all four feet hitting the ground together. This gait offers two advantages: it allows the deer to out-distance predators in rough terrain, and to see above the thick brush. If necessary, they can turn or completely reverse direction in the course of a single bound. During the middle of the day, the Mule Deer beds down in a cool, secluded place. The mature buck seems to prefer rocky ridges for bedding grounds, while the doe and fawn is more likely to bed down in the open. Mule Deer moves between various zones from the forest edges at higher elevations to the desert floor, depending on the season. While the Mule Deer occupies almost all types of habitat within its range, it seems to prefer arid, open areas and rocky hillsides. Food of the Mule Deer is quite varied. In Spring and Summer it feeds on green leaves, herbs, weeds and grasses more than on browse species. The reverse is true in Fall and Winter. Mule Deer are browsers and eat a great variety of vegetable matter, including fresh green leaves, twigs, lower branches of trees, and various grasses. They are particularly fond of blackberry and raspberry vines, grapes, mistletoe, mushrooms and ferns. They eat so carefully they can even consume the fruit of cactus. The mating season for Mule Deer reaches its peak in November and December, as antlered stags round up females and fight for their possession. Antlers are shed after the breeding season, from mid-January to about mid-April. Most mature bucks in good condition have lost theirs by the end of February; immature bucks generally lose them a little later. Males and females mix freely while traveling together in groups during winter months, often down to the desert floor. Life span in the wild is 10 years, but Mule Deer have lived up to 25 years in captivity . I am a farmer in Eastern Oregon and I can say that the farms in this region are VERY BENEFICIAL to the mule deer populations in the area. The abundant alfalfa fields supply them year round with a constant available food supply. Also, during tough winters this helps them to survive. In 1993 the desert populations took a huge hit. 65% of the herds died-off in what was a horribly tough winter but the deer close to "agricultural development" had a much higher survival rate! - R.A.J. There is some competition between the Mute Deer and the livestock on the range, especially in Spring and early Summer. Also, Hoof and Mouth Disease and other diseases can be transmitted from the Deer to the livestock and vice versa..
Mule Deer is a target for various viral, bacterial, and parasitic diseases. For example, heavy amounts of gastrointestinal nematodes may cause death in Mule Deer. 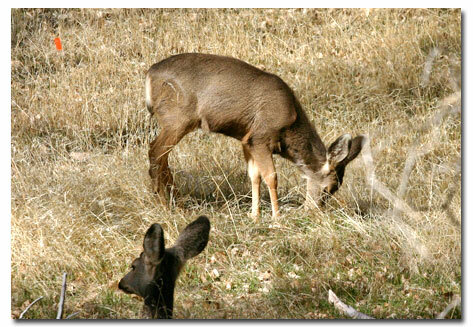 This parasitic disease is usually indicative of such predisposing factors as high Mule Deer density and malnutrition.